Beautifully engraved Certificate from the Kaiser Frazer issued in 1945 - 1948. 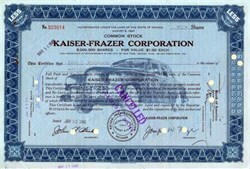 This historic document was printed by the Security Banknote Company and has an ornate border around it with an overprint of a 1949 Kaiser Frazer Automobile. This item has the printed signatures of the company's officers including Joseph Frazer as President and is over 54 years old. The underprint on this certificate was added years ago by Grover Criswell in an effort to jazz up these rather dull looking certificates. Grover was known for his expertise in the Civil War collectible bond and paper money area. Although the overprint was not part of the original certificate it certainly makes an interesting conversation piece, especially considering the car on the print wasn't even made when the certificate was issued. These overprint certificates are becoming quite collectible and hard to find. They add an interesting touch to this unique auto company collectible. 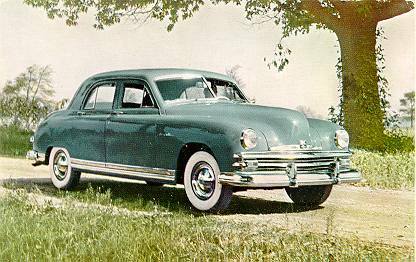 In 1951 Kaiser Frazer was in trouble. Sales had plummetted, dropping the company from ninth to fourteenth place. In a bold plan to save the company, Henry Kaiser borrowed $44 million to retool to produce a new line of affordable small cars.